today Mason joined me for another day of running errands. 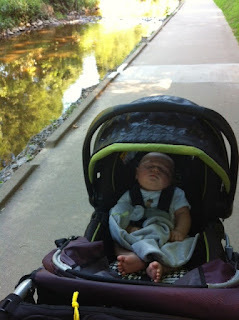 this time we drove over to the "greenway" by Target for a run followed by some shopping. "The Mecklenburg County greenway system is quickly becoming one of the finest in the nation. Greenways are vegetated natural buffers that improve water quality, reduce the impacts of flooding, and provide wildlife habitat. Greenway trails provide recreation, transportation, fitness, and economic benefits for all to enjoy. There are currently 37 miles of developed and 150 miles of undeveloped greenways in Mecklenburg County." Some of the trail is shaded which is perfect for warm summer days. I love not having to stop at intersections and traffic lights. 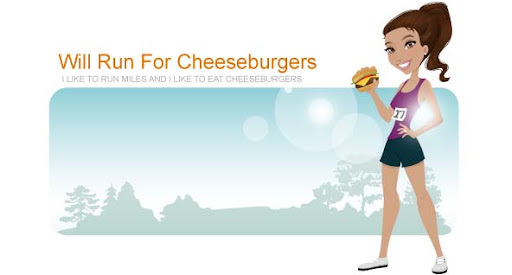 Once we were done with our 3.1 mile run, I stopped by a boutique to get a giftcard for a friend's birthday. While I was there I grabbed a complimentary drink. 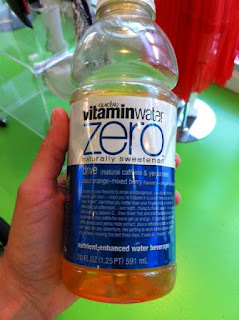 I love all flavors of Vitamin Water and was curious about the flavor "Drive" that I hadn't tried yet. It was pretty tasty and I definitely felt the extra surge of energy from the caffeine. 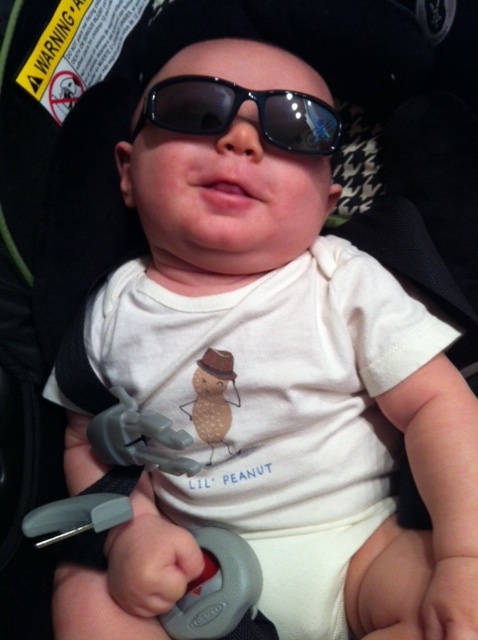 Finally we made it to Target and Mason walked out of there (rode in his car seat) with a new pair of shades. And don't worry ... this was taken at home; he's always buckled in when riding around.